We've still got one more Devilman Lady volume to release before the year is up, and here it is! As usual, many thanks to OtherSideofSky and Wright for this release. Expect to see some more Mars and Shutendoji soon! All I can say is.... Devilman Ghost! Translator and typesetter OtherSideofSky says that he does indeed sleep, and claims that he's not a cyborg though he admits to having a certain fondness for scarves. So cyborg or not, thanks goes to OtherSideofSky and Wright of HappyScans! for this release. 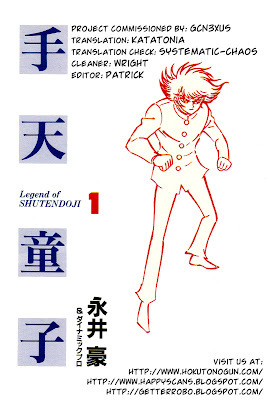 The Legend of Shutendoji continues! Big thanks to gcn3xus, Hokuto no Gun and HappyScans! And we're off to volume 2 of Yokoyama's end-of-the-world sci-fi manga, Mars! The clock's ticking, and only a single boy knows what's in store for Earth in its final hour. Thank you to Hokuto no Gun and HappyScans! for continuing to make this great manga available to English readers. Another new series for Go Nagai fans to enjoy, it's Legend of Shutendoji. 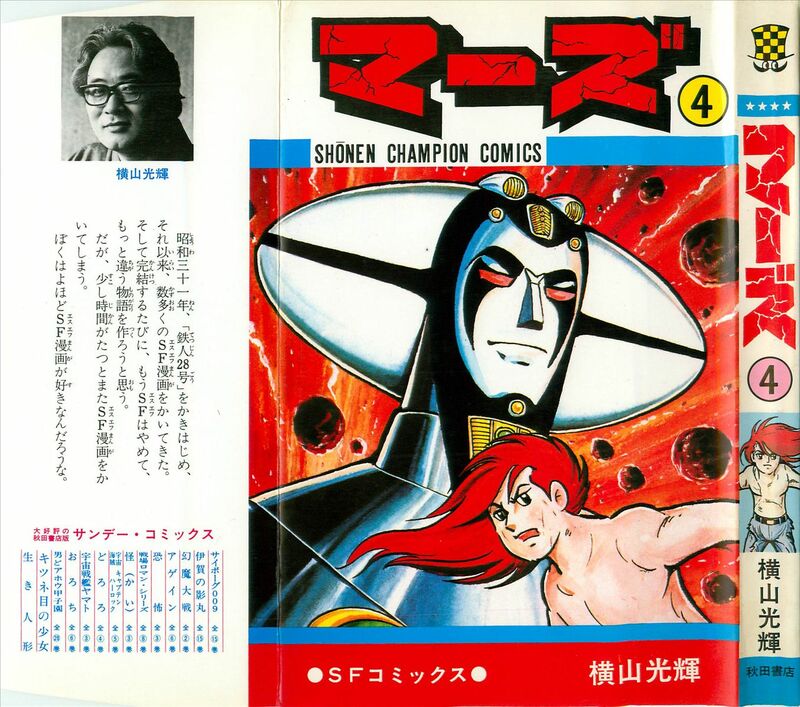 Like Grendizer, this project was commissioned by a reader. Thanks for making this possible! And like many of our ongoing projects, it's a collaboration with the dedicated members of Hokuto no Gun and HappyScans! 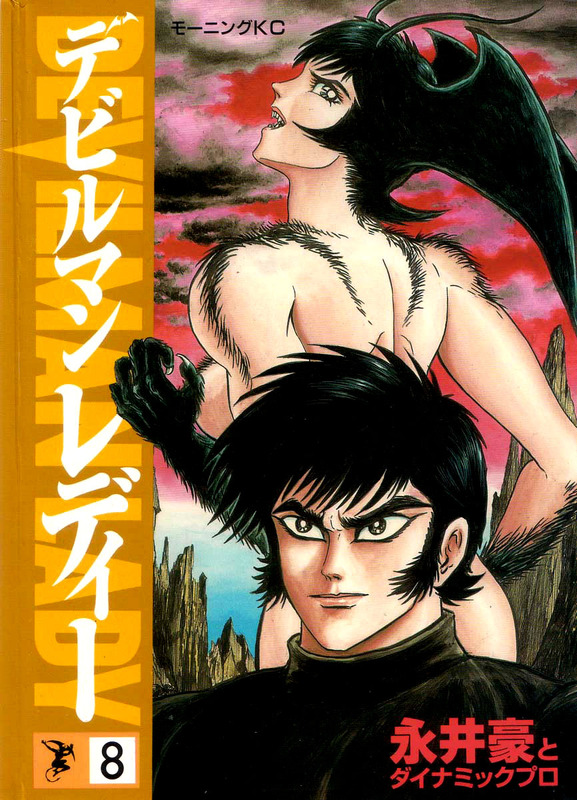 Gomaden Shutendoji, a manga by Masato Natsumoto that is based on Go Nagai's Shutendoji, is being scanlated by Kaizoku Scanz. Be sure so to check it out. Presenting volume 10 of Devilman Lady. But that's not all - I received volume 11 from OtherSideofSky today and it'll be ready for release soonish! And to add to that, OtherSideofSky plans to release volume 12 before the year is up. What a beast! Oh, and before I forget... OtherSideofSky says that he expects to be done with Devilman Lady by February. How does he do it? When does he sleep? Is he a cyborg? Many thanks to him and Wright of HappyScans! Unbeknownst to humanity, Earth's end is rapidly approaching. As Japan and America's naval forces struggle to defend themselves against the assault of the mysterious Titan, the planet's fate hangs in a precarious balance. It's up to Mars to decide whether or not Earth will cease to exist. Is humanity worth saving? This release is translated by Hokuto no Gun and cleaned by HappyScans! Be sure to visit them and give your thanks for this great classic by Yokoyama! Lady's journey through hell continues! This release is translated and typeset by OtherSideofSky, and cleaned by Wright of HappyScans! Only one more chapter left in the volume. Thanks to Hokuto no Gun and HappyScans! for translation and cleaning. Our newest project, another collaboration between Dynamic Pro Scanlations, HappyScans! and Hokuto no Gun. 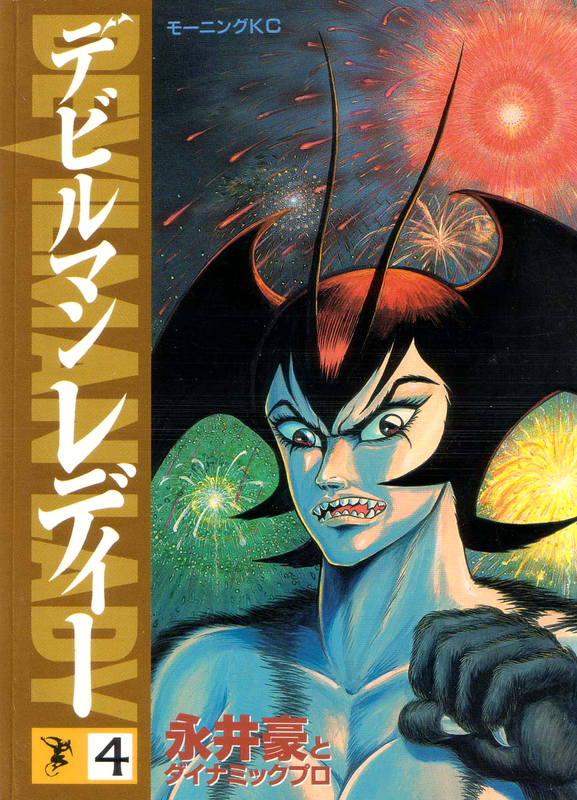 This time its the final entry in Gosaku Ota's Mazinger trilogy - UFO Robo Grendizer. In case you didn't know, Gosaku Ota is the third major member of Dynamic Productions. He, Ishikawa and Nagai all worked on various manga together that have become classics today. 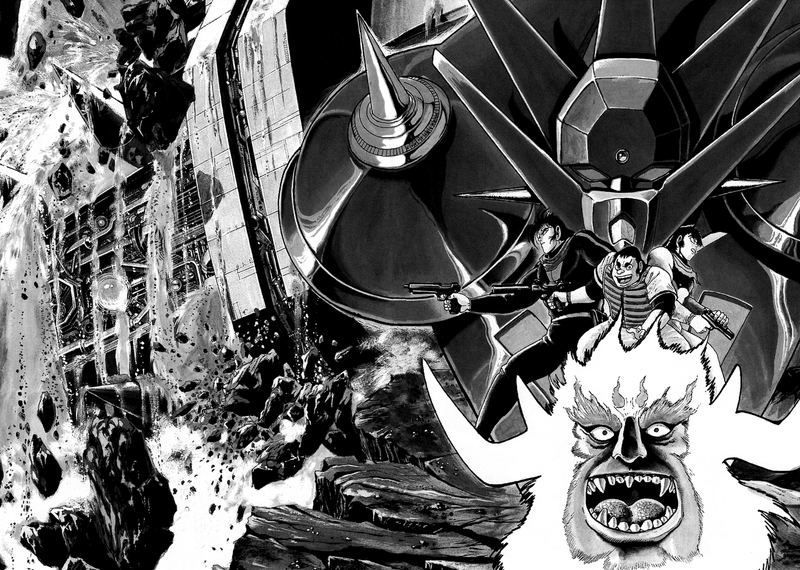 Now, before anyone points out that we haven't even done Ota's Mazinger Z and Great Mazinger yet, hear this: This is a commissioned project by one of the readers, the very same person who commissioned Nagai's version of the Grendizer manga in the past (he is awesome and has my eternal thanks for making these Grendizer projects possible). Therefore, we're doing as he requested! Hopefully we'll be able to do the other parts of the trilogy in the future. And there you have it. The second entry in the Getter Robo Saga series, Getter Robo G, has finally been brought to completion. With this post, the only main Getter Robo series left untranslated is the final story of the saga - Getter Robo Arc. I'd like to thank OtherSideofSky for stepping up and translating this part of the series in his usual speedy manner. 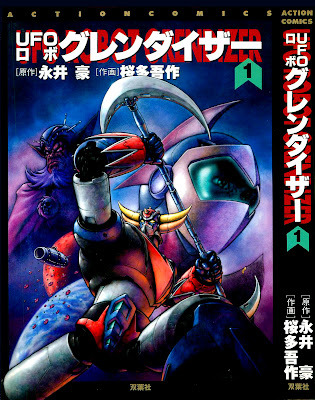 When I started on this journey in 2008, the only translated Getter Robo manga was the first volume of the first series. 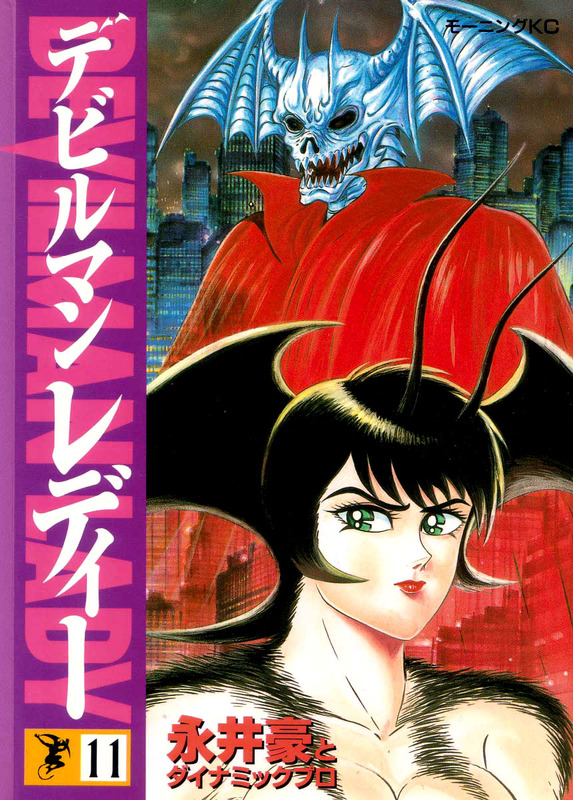 Many were familiar with the OVA/TV releases but had little to no knowledge of the manga that influenced a whole generation of creators and fans in Japan. I decided to get this great series translated, but due to the difficulty of finding willing translators, I had to scanlate Getter Robo in an out of order manner; The first series we released was Shin Getter Robo because it was the shortest, thus the easiest to find a translator for. 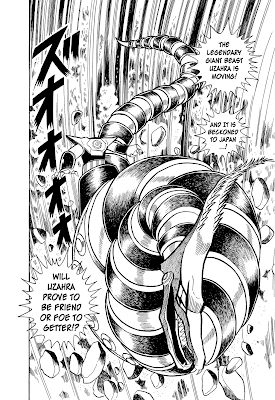 Then I found translators to help me with Getter Robo Go because it was a relatively unknown part of the saga, yet probably the most pivotal point in the series. I wanted to get it out of the way because translators would come and go, and I never knew if I was going to be able to get another Getter series translated. 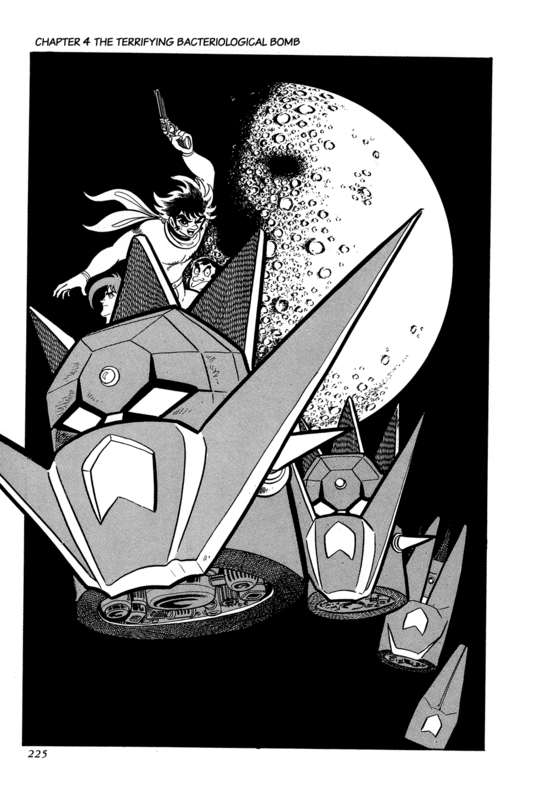 Fortunately, we've been able to do Getter Robo and Getter Robo G since then even though I still have to deal with importing and scanning the books myself as well as trying to reel in translators with promises of money. It's truly a miracle that Getter scanlations have even gotten this far. It's all thanks to the hard work of the various translators I've had the pleasure of working with over the years and the financial support I've gotten from donators. Not to mention my stubbornness, I guess. Anyhow, enjoy. 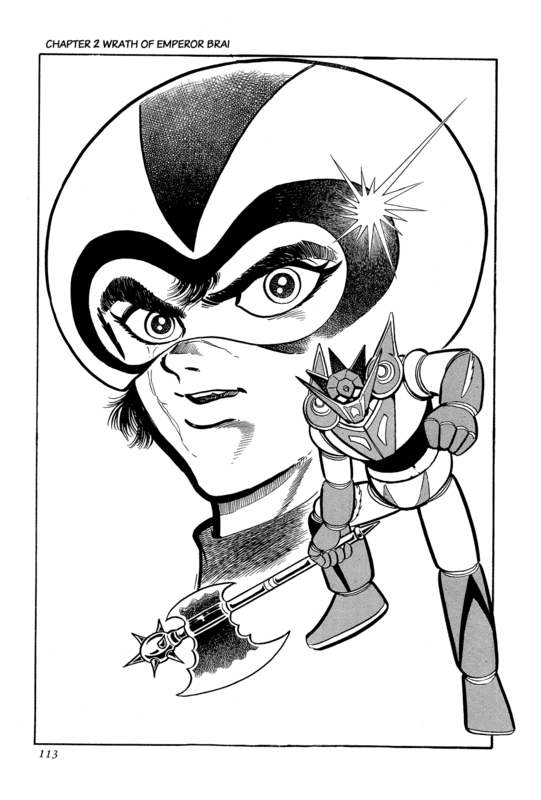 I've got no solid date for when I'll start Getter Robo Arc, but I'll probably get to scanning it after my finals are finished. 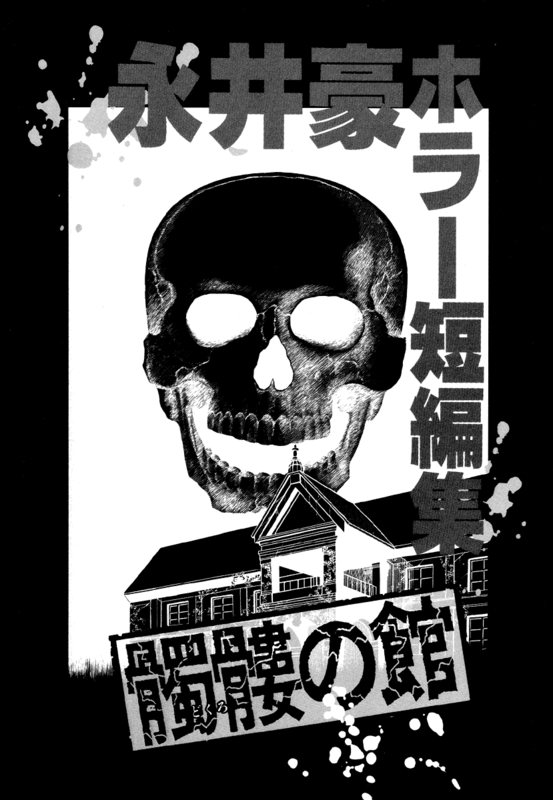 Presenting the final chapter of Go Nagai's horror story collection: Skull Manor! This is one bizarre, disturbing and strangely sweet story. I hope you all enjoy it. Many thanks to illustrious translator OtherSideofSky and my comrade-in-scanlation, Wright of HappyScans! Thanks guys, you're the best! 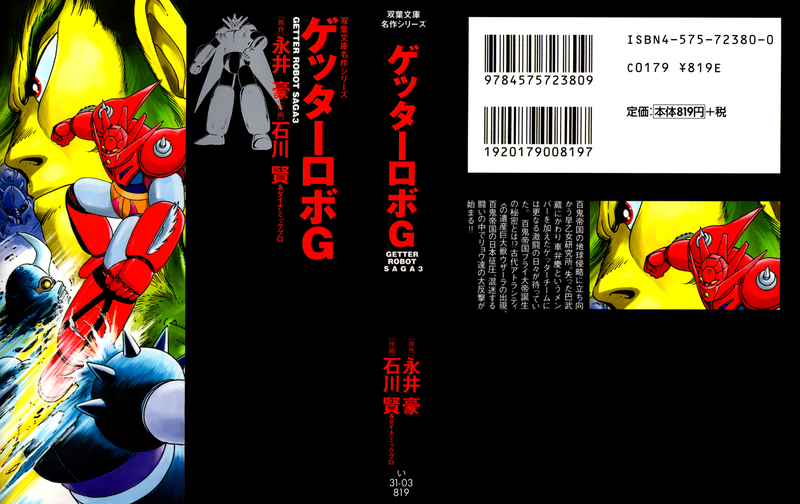 Next release will be the completion of Getter Robo G! Expect to see it soon!! The continuation of the massive final chapter! Not much to say without spoiling it, so let me tell you about how I went blind this week. So there I was, typing away in photoshop, when my eyes started acting up. The stinging sensation was fairly intense, so I stopped what I was doing and tried to tend to my eyes. As time passed, the pain intensified, and it was getting harder and harder to keep my eyes open. Long agony short, I couldn't open my eyes for about two days and any amount of light caused severe pain. I went to an optician as soon as I could. Turns out, my contacts had some buildup on them due to their age, and had severely irritated my upper cornea in each eye. Luckily, the condition was temporary and I just needed to give my eyes some rest. Instead of doing that, I completed this chapter. We're halfway through volume 1 with this installment of Mars! In this chapter, many of the mysteries surrounding the titular main character become clear as the nature of the plot reveals itself. This release is brought to you in part by Hokuto no Gun and HappyScans!, be sure to check out all of their great projects. Look forward to the next installment of Getter Robo G and the last chapter of Dokuro no Yakata soon! Wow! 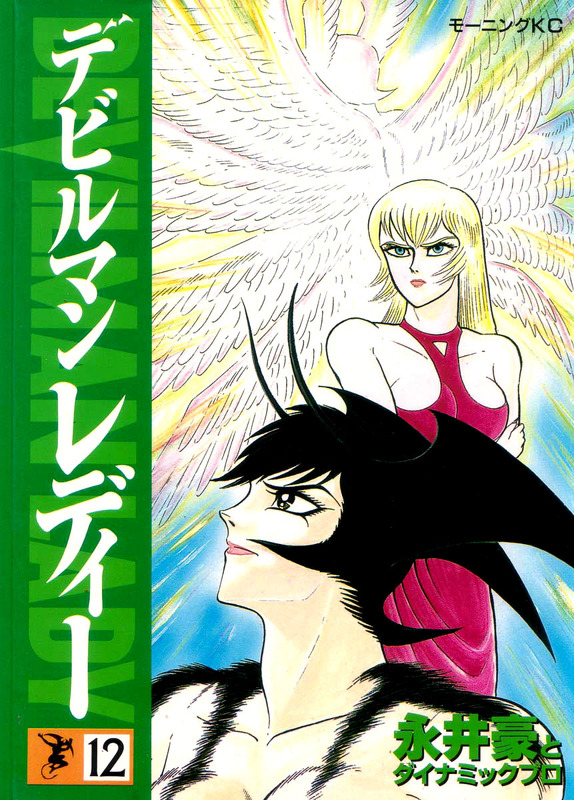 With this volume, Devilman Lady truly feels like the successor to Devilman as the two plots are now completely intertwined. 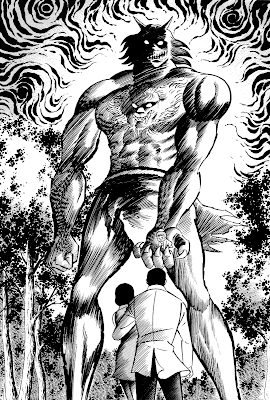 I've really got to hand it to Nagai for making Dante's Divine Comedy the in-canon basis for this story. Also, the release of this volume means we're about halfway done with the series. Everyone, be sure to give many, many thanks to OtherSideofSky. 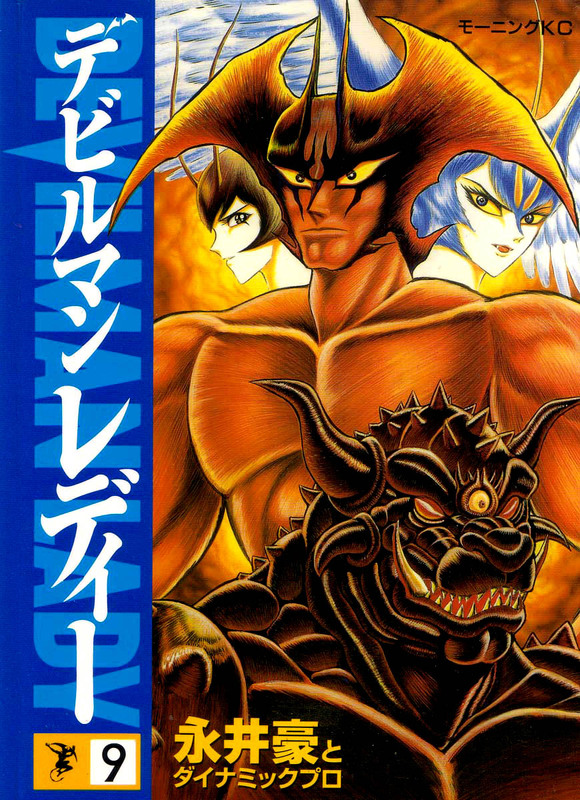 He came out of seemingly nowhere, translated all of Amon in an unheard of amount of time (and completed Devilman vs Getter Robo at the same time just because) and has now burned through half of Devilman Lady in three months! Be sure to check out our buddies over at HappyScans! 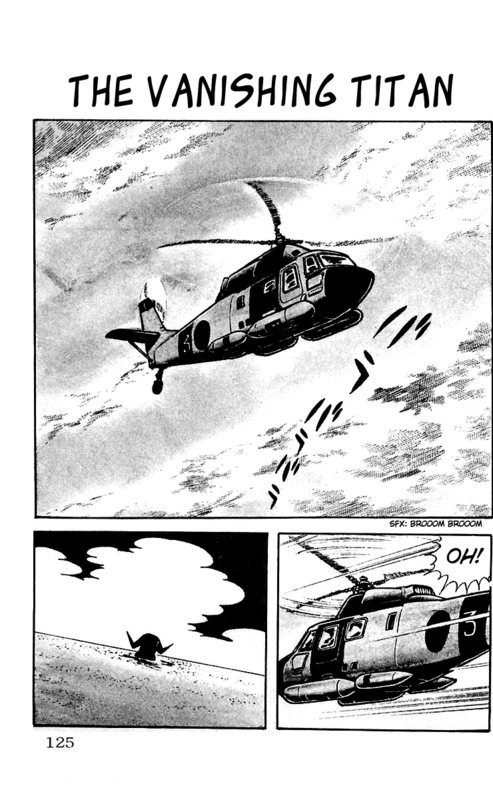 This is the beginning of Getter Robo G's final chapter. I'm releasing this chapter in three separate parts because not only is it over 200 pages in length, but every page is crammed with text and there are two page spreads everywhere. Not surprisingly, this "chapter" was originally published as multiple interconnected chapters - which explains the overall length. I apologize for not releasing it all at one time, but this single chapter is nearly as long as the four previous chapters combined - it really does make up nearly half of the entire book. Hi all, it's time for another chapter of Dokuro no Yakata. 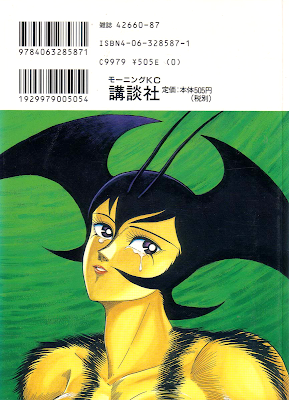 This time, it's a story by Nagai's younger brother who goes under the pen name of Kouenji Hiroshi. Enjoy. This release is translated by OtherSideofSky and cleaned by Wright of HappyScans! Thanks! Here it is! In this chapter, rocks are smashed and boats are borrowed. Also robots. Many thanks to Hokuto no Gun and HappyScans! for making this possible. Today's release is Dokuro no Yakata chapter 3 translated by OtherSideofSky and cleaned by Wright. 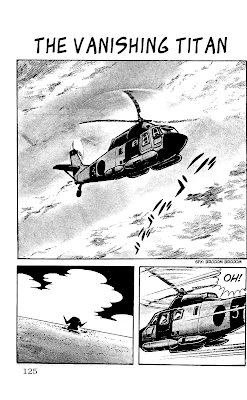 Unfortunately, Mars chapter 3 will be delayed until Tuesday due to unforeseen circumstances on Hokuto no Gun's part. Sorry about that. Anyhow, enjoy! We're just one chapter away from completion now. The next chapter after this one is the final - but its nearly 200 pages in length (that's an entire volume for most series)! 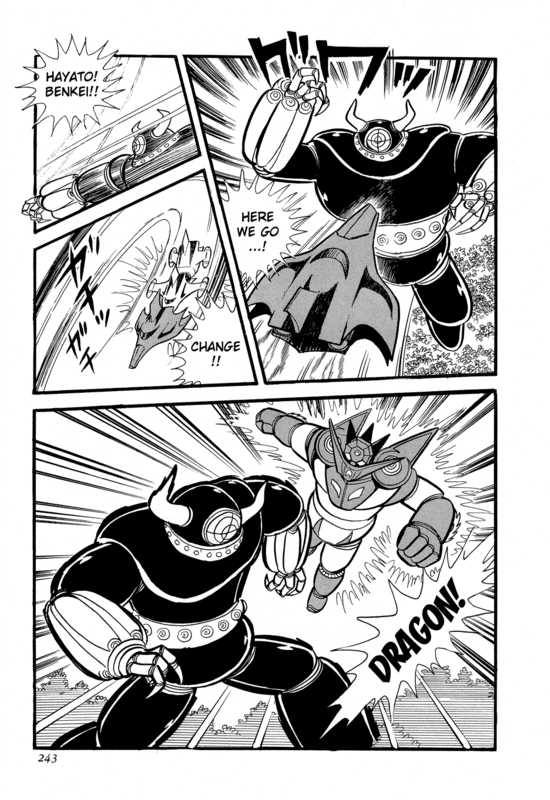 Therefore, Getter Robo G Chapter 5 will be released in two parts. Many thanks to OtherSideofSky for his translation. In other news, expect a Mars and Dokuro no Yakata release tomorrow! 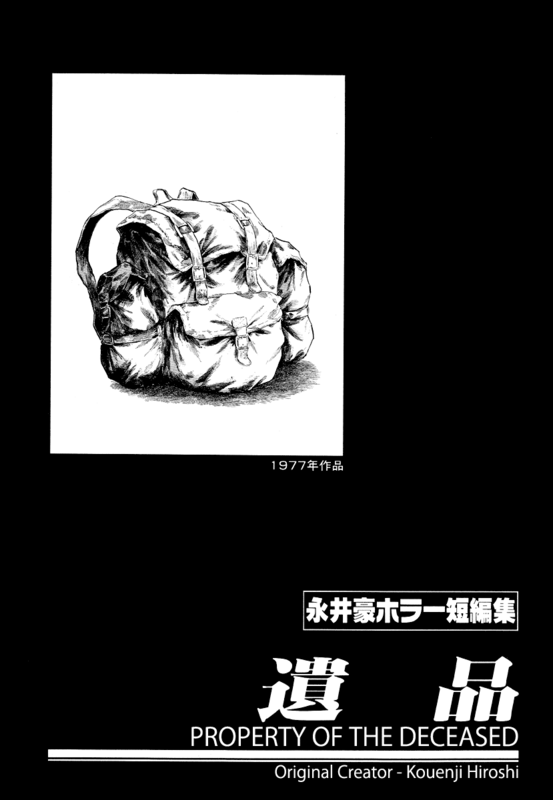 Here's chapter 2 of Go Nagai's horror story collection, Dokuro no Yakata. That's right, another new project! 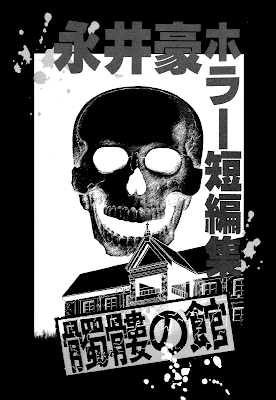 This time, it's Go Nagai's Dokuro - a collection of horror themed short-stories being translated by OtherSideofSky. In addition, it's time for another chapter of Getter Robo G (also translated by OtherSideofSky). This time, it's a brand new story exclusive to Getter Robo Saga focusing on the origin of the Hyakki Empire. To top it off, we've got another chapter of Yokoyama's Mars. Translation by our friends at Hokuto no Gun. Many thanks to OtherSideofSky, Hokuto no Gun and HappyScans! 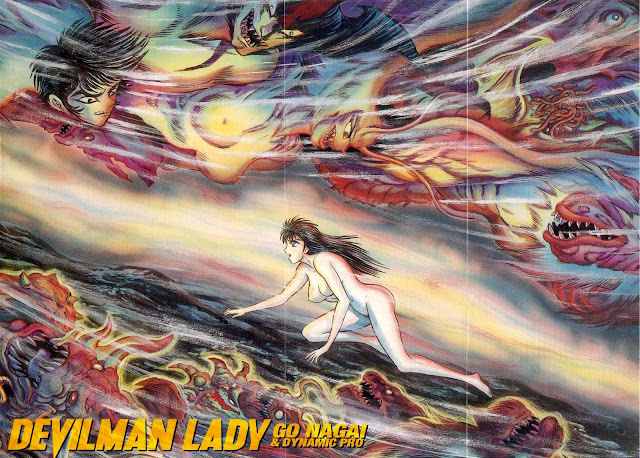 OtherSideofSky comes through with another installment of Go Nagai's Devilman Lady! 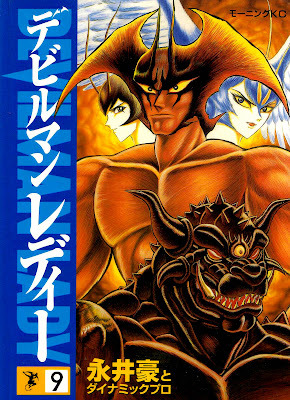 And in this volume, its connection to Devilman starts to materialize - both literally and figuratively. 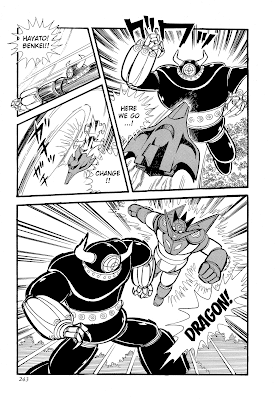 This manga is not related to Go Nagai's Dynamic Pro in any way... But, as a fan of mecha and manga in general, I really wanted to read this in English. 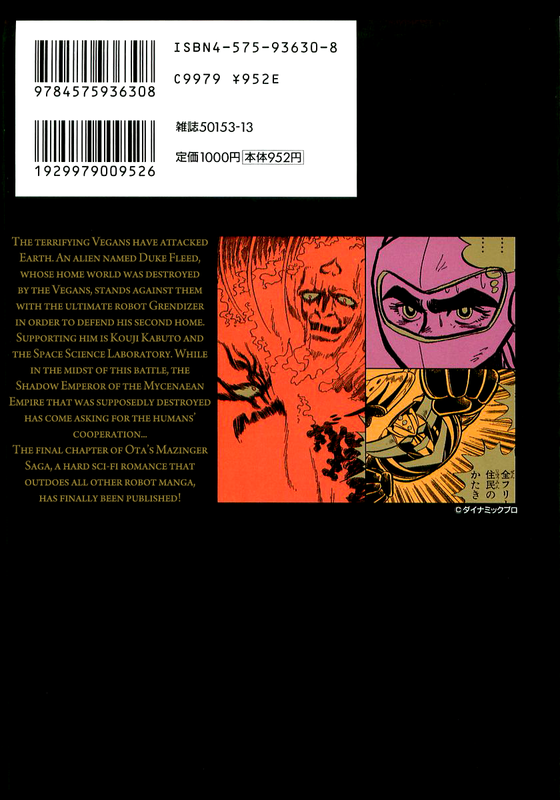 Well, Katatonia of Hokuto no Gun has set out to make that possible with his translation of Yokoyama's Mars! This is a joint project between us, Hokuto no Gun and HappyScans! 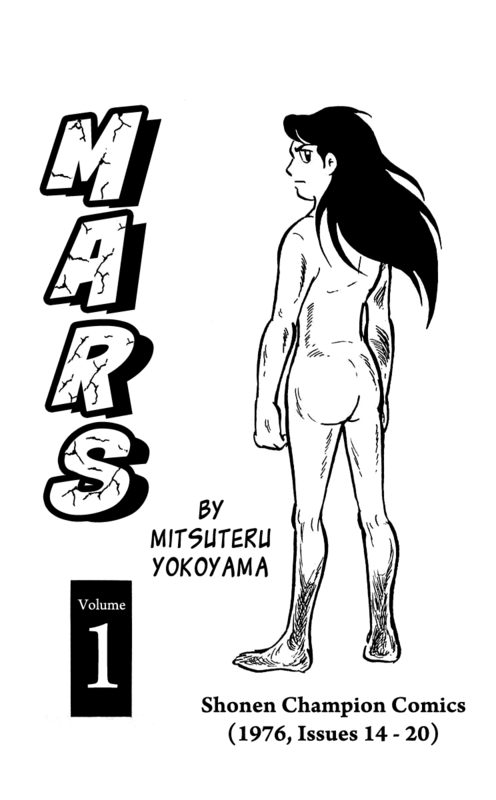 We're proud to present: Mars Volume 1 Chapter 1. 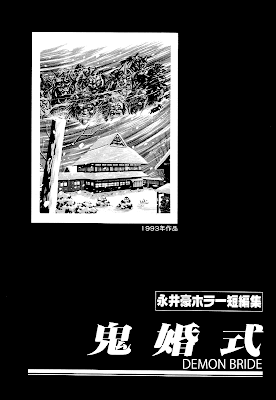 Don't forget to check out other Yokoyama related scanlations, such as his adaption of Romance of the Three Kingdoms, called Sangokushi, which is being translated by Hox. 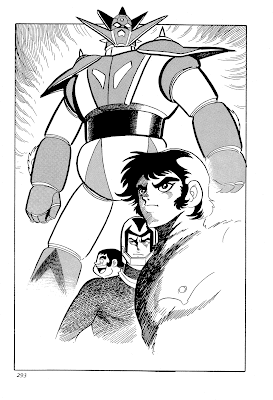 Presenting Getter Robo G Chapter 2. In addition to this release, I would also like to officially announce that Dynamic Pro Scanlations will be teaming up with HappyScans! 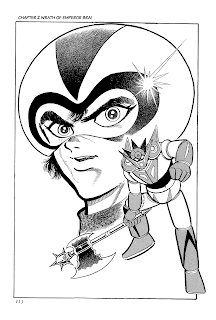 and Hokuto no Gun to scanlate Mars by the legendary Mitsuteru Yokoyama. Expect the first chapter of this series to be released sometime next week along with the third chapter of Getter Robo G.
Man, it sure was difficult getting this released. But, it's finally here! Many, many thanks to OtherSideofSky for translating this and a shout out to Wright for checking over the work. 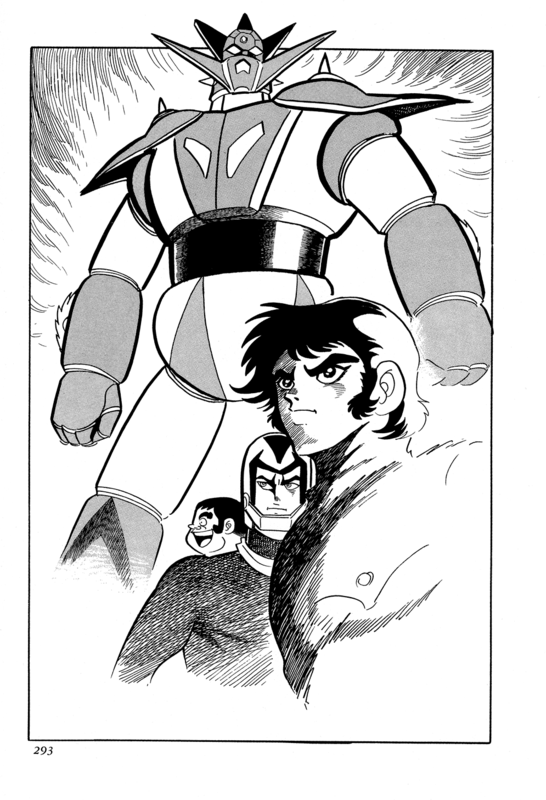 Getter Robo G consists of 5 chapters, and I'll release one per week. 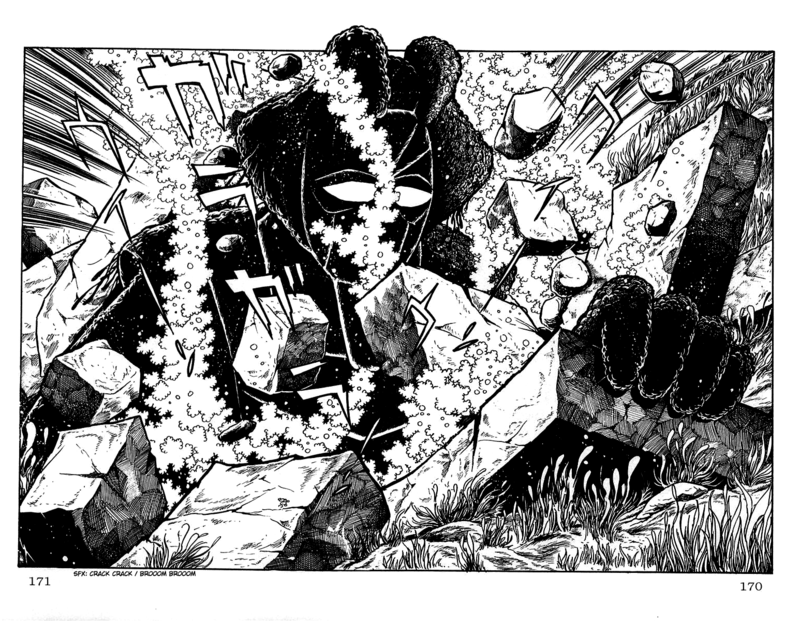 Now, with that out of the way, I'd like to talk about future Getter Robo projects; namely Getter Robo Arc. Aside from Shin Getter Robo, I have had to personally pay for the translation of each Getter Robo series due to the scarcity of translators. This has cost me about $250 in all (not counting the fees for actually buying the books), and now that total has jumped up to $350 with the translation of Getter Robo G. So what am I getting at? Well, this: I need donations. Getter Robo Arc, at this rate, will not be released unless I can scrounge up another $100 that I don't have. You may be thinking, "Oh, I don't have the money to spare!" Well, I know that feeling, because I'm completely broke from spending all of my free money on this stuff. But consider this: thousands of people download these releases (that's just mediafire links. I'm not even counting everyone who reads it on sites like mangafox or get it from alternative download links/torrents) so if just a small portion of readers donated anywhere from $2 to $5, paying for the translation is easy. I'm not asking for a high dollar value, I'm just asking for a lot of people to chip in a very small amount of money. Basically, we need to spirit bomb these translation fees. Now, there have been those of you that have donated in the past. Thank you! This message is not for you - you've done your part and I fully appreciate all the help I've gotten financially for these projects. Once again, thank you. You're the reason that the Getter scanlations have even gotten this far. I've tried my hardest to bring everyone these great comics by Dynamic Pro for nearly 4 years now, and I'm asking you - those who get to enjoy these releases - to help me help you. 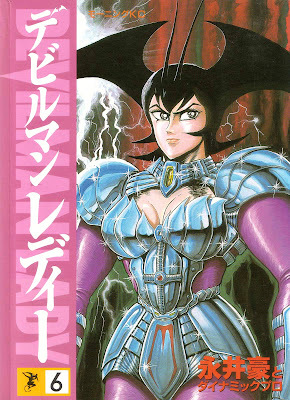 Remember this - Getter Robo G was delayed so long because of translator and financial difficulties. Anyhow, that's the gist of things. 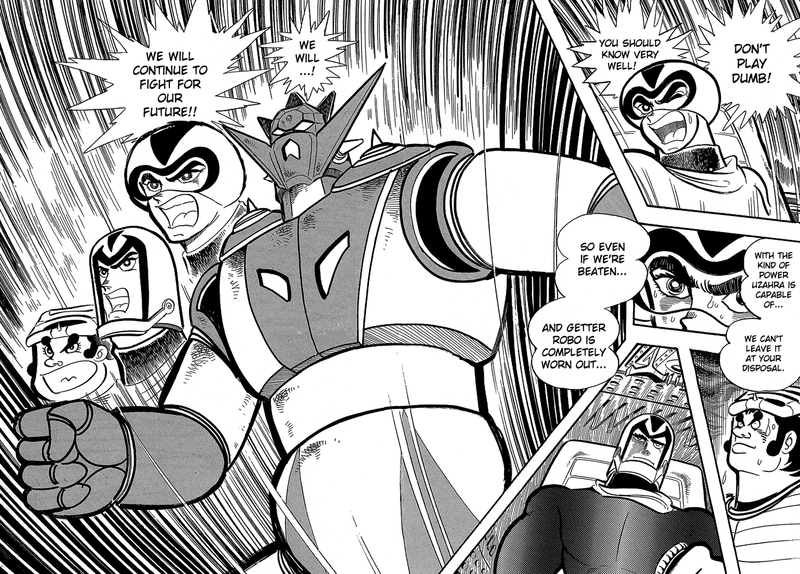 Enjoy reading Getter Robo G Chapter 1! UPDATE: In just a few days, we've reached our goal! I cannot thank you all enough for your support. Look forward to Getter Robo Arc! Six down, Eleven to go! Once again, many thanks to OtherSideofSky and Wright for all of their hard work in making this release possible. Following last month's flurry of Devilman Lady releases is - guess what - another volume of Devilman Lady! Once again, many thanks to OtherSideofSky for translating and typesetting this release, along with Wright for cleaning.